Written for a slide presentation, author unknown. Circa 1990s. Before Avondale’s existence the areas of Henrietta and Caroleen were thriving industrial communities. Raleigh Rutherford Haynes and S. B. Tanner had built the Henrietta Plant in 1887, and eight years later Henrietta No. 2 at Caroleen. Henrietta Street, running from Pea Ridge Road through Southwest Henrietta was the business district along which Haynes’ Stores (grocery, drug, and dry goods) were built. Also a bank, a hotel (which was later used as a mortuary), Dr. Wiseman’s office, a dentist, Dr. Whisnant, later turned into a grocery store, a hospital operated by Dr. Amos C. Duncan, and some of the finest homes of the day. 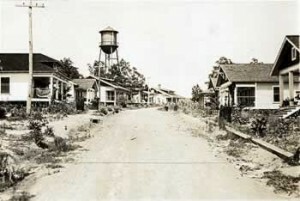 The northeast section of the street was known as Rabbit Town. R. R. Haynes owned a great portion of the land surrounding the village of Henrietta, extending to Caroleen and Cliffside. Pioneer Industrialist, Haynes, had founded the Florence Mill in 1892, rebuilding it in 1897, and built the Cliffside Mill in 1901. Mr. Haynes laid the plans for constructing the Haynes Plant and community of Avondale. It was his plan that he and his family would build the mill and village. Holding the first meeting of incorporators, stock holders, and directors on July 11, 1916, The Haynes Mills, Inc. Elected R. R. Haynes, president, Charles H. Haynes, vice-president, and Z. O. Jenkins, Secretary-Treasurer. A resolution was passed to purchase the 140 acre tract of land from R. R. Haynes on which already existed 13 dwellings and various other improvements. Plans were also approved for a 20,000 spindle spinning and weave mill. The land transactions were completed on September 25, 1916, and a general merchandise store was opened and operated in connection with the company store in Cliffside. The U. S. Post Office was established and located in this building. Mr. Haynes named the community “Avondale” after his winter home in St. Petersburg, Florida. John G. Roach was given the responsibility of managing the store and becoming the first postmaster. L. G. Garvin was a later postmaster. The railroad was extended from Cliffside Junction to the new plant site and construction began on the mill and village. Mr. Haynes died February 6, 1917, while on vacation at his winter home in St. Petersburg. Naturally the sudden passing of Mr. Haynes, together with the beginning of WWI, caused a delay in building the mill; however, during 1917 accomplishments were noted. A two-story Card and Spinning building with a one-story picker building adjoining was near completion. A one-story boiler and engine room building and a two-story cotton warehouse were complete as well as 20 dwellings with others under construction. Excavation for the Slasher Room and Dye House was underway. In a meeting of the directors on November 30, 1917, the decision was made to sell the property to Cliffside Mills and dissolve the corporation of Haynes Mills, Inc. Charles H. Haynes succeeded his father as president of all his enterprises and it was under his management that the new mill was completed. James N. Goode was brought from Cliffside in 1918 as Master Mechanic. 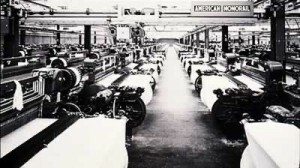 In 1919 machinery was installed and operation of a hosiery mill manufacturing men’s socks was started. Records state it would produce 420 dozen pairs half hose per day. Mr. Goode often described the turkey dinners served to all employees to celebrate the completion of different sections of the plant. 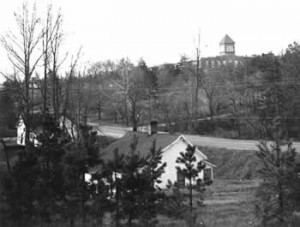 Addie Radford came to Avondale in 1919. He carried water from a nearby spring for the men constructing the building. He said they complained because the water was warm by the time he got from the spring to the construction site. When the machinery was installed Addie started up the first spinning frame. He made a career of doffing. Miss Euzelia Wood was one of the first spinners. She was working at Henrietta, but the company needed spinners and would only give her brother, Timmons, a job if she came too. Cotton was the king in 1923 in Rutherford County. A large cotton gin was built near the Haynes Plant to serve the farmers in the area. Mr. R. E. (Bob) Jenkins, Outside Overseer, also operated the gin. The ginned cotton was bought by the mill on the yard. The cotton gin operation was discontinued in the early 1940’s and the machinery was sold, but the building was not torn down until the mid 1960’s. Jake Hill was the first overseer of spinning. At this time it is unknown if he also had carding. From time to time both departments have been under the same manager. Mr. Hill left the company in 1924 and returned in 1931 as overseer of spinning at Cliffside. Mr. Thomas Hampton was overseer Carding from the mid 1920’s until 1940, and Mr. Jim Frye was overseer of Spinning during that time. Flavous Young Cantrell was the first overseer of weaving and served until his death February 6, 1927. He helped organize the Haynes Memorial Baptist Church and was a leader in all phases of church work and the community. He hired Will and Ed Huskey on the condition that they join Haynes Memorial and sing in the choir. At his death the mill and all stores stood for the day and the school had no afternoon session so that everyone could attend his funeral. His widow, Laura, was allowed to live on in the company house they occupied until her death. Maurice Hendrick was the first Superintendent of the mill. He was transferred from Cliffside to Haynes and was promoted back to Cliffside as their Superintendent in 1921. H. G. Rollins, who was overseer spinning at Cliffside, took his place as superintendent of Haynes, where he remained until he left the company in 1942. The 1920’s were growing years for the plant and the community. The company built two elementary schools for employee’s children. The first building was two large houses joined together by a covered walkway, located on the street leading to the Methodist Church. Professor Frank S Hall was hired by the company as the first principal. High school students were bused to Cliffside until 1933, when the state assumed the responsibility for all schools. The second school was a one story brick building on Circle Park. When the village was dismantled in the 1960’s the school was closed. Mr. Lionell Smith was the last principal. The building was used by Rutherford County as a Technical school which was the forerunner of Isothermal Community College. When the school moved to the present campus the building was turned over to private business. With a great deal of assistance from the mill company, Avondale people erected two beautiful houses of worship. Haynes Memorial Baptist Church, established in 1919, completed their building in 1924, and the Avondale United Methodist Church completed their building later that same year. Prior to building the churches the groups met in the Knitting Mill building on alternating Sundays. The mill company provided the land for the churches and gave generously to build the buildings. Haynes Memorial’s Treasurer’s report in July 1923 showed of the $15,000 taken in $5,700 was contributed by Cliffside Mills and $3,000 was a note discounted by them. The churches have always worked in close harmony with one another. Vacation Bible Schools were conducted for all children in the village. 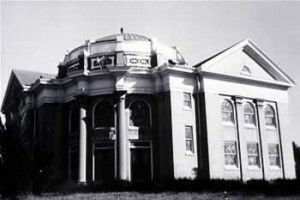 When the Baptist Church Building burned in 1973, the congregation was invited to use the Methodist building until their new building could be constructed. Community life centered around the churches and the school. As there were few automobiles everyone walked to work, to church, and to school. Sunday afternoon walks were common when whole families converged on the park maintained by the company between the mill and the railroad tracks which ran to Henrietta. A small pond with a 12′ dam provided water for the mill and ran through the park. A Band House was constructed for Band Concerts and community meetings. The old knitting mill was also used for meetings. The company also showed movies in the old knitting mill before the R. R. Haynes Memorial Building and Cliffside Theater were completed. Activities held in Cliffside were open to people of Avondale and were taken advantage of when transportation was available. The community was a safe place for everyone. Doors were seldom locked and children could roam around the whole village without fear of man or beast. No dogs were allowed, a rule made by R. R. Haynes and enforced by future management, and no drunks or disorderly conduct was permitted. Anyone convicted of breaking laws were relieved of their duties with Cliffside and Avondale Mills and must move from the village. Avondale boasted one of the best ball parks in the area. The company supported a ball team then as now, and has continued to support ball teams and all forms of recreation. The depression caused a definite slow down in the textile industry, but Avondale was able to operate two or three days per week. J. L. Beard was superintendent during WWII, and Haynes Plant was placed on 100% war production. Tent twill for the army, herringbone twill for work uniforms, and osnaburg products for sandbags were produced. The young men left the plant to join the armed forces and the people buckled down to help win the war. Savings bonds were purchased during the special drives. During the first war loan drive employees purchased $21,731, and during the second drive $116,737 were purchased in the Avondale community. Employees received the Treasury Minute Man Flag and certificates in recognition. To receive this award, 90% of employees contributed 10% of their weekly wages toward purchases of war bonds. A vital program of the government was to collect all available scrap metal for war purposes. Cliffside Mill and Avondale Mill disposed and put into war production channels 2,510,520 pounds scrap iron and more than 12,000 pounds scrap brass, zinc, and copper, and 3,000 pounds waste paper. All families were encouraged to plant vegetable gardens, and to assist in preserving their produce, a cannery was operated in Cliffside. Employees only paid for the cans. The Proximity Manufacturing Company had purchased the controlling interest of Cliffside Mills, Inc. in 1927, and in 1951 became total owner of these plants. Charles Haynes, who had served as president since his father’s death, retired in 1945. Maurice Hendrick succeeded him until his retirement in 1951, at which time Earle Stall, Sr. was elected president of Cliffside Mills. In 1951 the Cliffside Mills merged with Cone Mills Corporation and Mr. Stall was named a vice-president The mill was under his management until his retirement in 1960, and he was succeeded by Earle Stall, Jr. The company began a very special benefit for employees in November 1946. Health Insurance provided coverage for the employee and his family. The company continued to prosper and wages increased and special benefits such as holiday pay and vacation pay were given to employees. By the early 1950’s change was in the air. Ray Stallings was named superintendent. Do you remember his overseers and supervisors? Market demands required a change in fabrics. The dyeing operation was closed and the plant began manufacturing corduroy. These markets were strong for almost 30 years. The plant expanded the building and increased to 30,112 spindles and 780 X3 Draper looms. From 1963-1965 the windows were blocked, air change towers and air conditioning installed, and overhead cleaners were installed. In the early 70’s we began testing shuttleless looms. A young fellow by the name of Bud Willis headed the first Sulzer operation. Safety has been given priority by the company and her employees. Programs designed to recognize employees for safe job performance, as well as top quality and efficiency, were enacted. Safety committees were formed and hours worked without a lost-time accident were recognized. Under the leadership of Bill Davidson, Personnel and Safety Manager, Haynes Plant set outstanding records. The first 1,000,000 Safe Hours Recognition was held at the Spindale House. A 2,000,000 Safe Hours Celebration was held at Cedar Park on September 5, 1964. In more recent years Haynes Plant won the Corporate Safety Award three consecutive years, 1989, 1990, and 1991. The Dope wagon is another way we celebrated safety achievement. Purchases were made with safety dollars. Society changed and owning automobiles was within reach of most families and home ownership was desirable. High cost of materials and labor too, were factors that led the company to cease providing houses for employees. During the 1960’s all houses were removed from Cone lands. Earle Stall, Jr. encouraged participation of both Haynes and Florence plants in many activities. Service Recognition Banquets were held jointly from 1965 to 1975. The plants now hold their own service recognition programs. Through the years everyone worked diligently to uphold a standard of excellence. Achievement has always been recognized and rewarded by the company. There have always been fun times along the way. Fellowship with friends helps the work seem lighter. As fishing was enjoyed by many, a fishing club was formed and friendly competition was encouraged. Employees paid a small membership fee which was used to purchase prizes. The company picked up the tab for the year end celebration meal. Family Days have been a time of fun and fellowship. Through the years these were generally held at Cedar Park. A special event was Super Doffer Contests with doffers from other textile plants. Charles Vickers and Danny Radford were our Super doffers. The health of employees has always been of concern to the company. During early years a doctor and nurse were employed to attend the sick. In later years a plant nurse has been engaged to offer employees medical assistance as well as manage other health programs of the company. The company began recognizing those with perfect attendance in 1974. Since that time annual recognition events are held and gifts of choice are made according to the number of years of consecutive perfect attendance. The 1980’s brought significant change to Haynes Plant. The customer’s demand for wider fabrics influenced the decision to install wider, high speed looms at Haynes Plant. Our sister plant, Florence, would furnish the warp yarn. This required further expansion of the weave room, but eliminated the need for Spooling and Slashing processes. In 1985, in order to strengthen the organization the decision was made to place Haynes and Florence under one manager, superintendent, and personnel manager. Joe Miller was named General Manager, Claude Pinnix, Superintendent, and Terry Robbins, Personnel Manager, and as the market for corduroy declined by 1990 all looms were on denim. As both Haynes and Cliffside Plants were manufacturing denim, all Rutherford County plants of Cone Mills were placed under one General Manager, Terry Hines. David Eaker was named Production Manager. Haynes People have always been generous and caring. They give money to United Way, their blood through Bloodmobile visits, and they show their love and concern for one another. At retirement each employee is given a dinner by their fellow workers. Cone Mills continues to recognize her employees even after retirement. Annual dinners are held to honor retirees. Ever-changing, retooling, enlarging, and modernizing, Haynes Plant has evolved into one of the world’s finest textile plants, and this is evidenced as this year Textile World magazine named her one of the top 10 plants in the world. It could never have happened without the dedication of her people who have made her strong. The plant has survived many economical ups and downs, but her people have remained loyal. Some have worked more than 50 years before retiring. Ethel Wilkins is our only living retiree with over 50 years of service. Although the village of Avondale is only a memory in our hearts, Haynes Plant stands as a memorial to its founder, Raleigh Rutherford Haynes, and to the highly skilled, dedicated, and loyal employees who have made it the success it is today.